The more I study for my CRNI the more questions I come up with.Â My question is.Â Caps are considered an add on device.Â When a patient is receiving TPN that is intermittant.Â Say from 7 p.m. to 7 a.m. in the morning.Â When that administration set comes down and is discarded should the cap be changed as well.Â According to the book I am studying by I'm thinking it should.Â Admin. sets are an add on device and so is the cap.Â Am I correct in thinking that any time that administration set is changed then the cap it was attached to must be changed as well? Not quite. INS standards has different types of tubing - continuous and intermittent with different change intervals for each. The CDC guidelines do not make the same distinction, and simply states that all tubing should be changed no more frequently than 72 hours. The TPN tubing you mentioned is considered an intermittent tubing and thus should be discarded after each use with a new tubing used for the next infusion. Changing the needleless connector/injection cap for intermittent tubing should be done at least every 7 days according to INS standard #35. So the tubing is changed every day and the cap is changed at least once a week. However the facility/agency policy may call for changing that cap more frequently. I am not sure what book you are using, but you must answer test questions according to the INS standards of practice. I am using the Core Curriculum for Infusion Nursing book from INS. It is the 3rd edition. I was just confused regarding the caps because I knew they were considered and add on and was trying to make sure that I am doing right. Now that I have read the standards I feel better. We always change our TPN tubing and filter every day. I was concerned because we have been changing our caps weekly with dressing changes. When I was reading about add-ons and thinking about that TPN line being changed I was trying to figure out if I needed to be changing the cap as well. I was going by INS standard #29 for add on's. I didn't go far enough into the book and read thoroughly. Thank you so much for your reply. I want to make sure we are doing the right thing for our patients and I want to make sure I learn things properly for the upcoming exam. I'm sure with time and repitition these things will come naturally. Yes, pretty soon it will be second nature. Also, the most recent edition of the Standards came out after the Core Curriculum was published. So answer by the most recent Standards document. I can not think of any specific time intervals that we changed in this edition of the standards, but it would always be good to compare those 2 resources. The Standards I have is the January/February 2006 edition. It is what INS sent me to study by. If I am correct it is the most recently updated version. Thank you so much for your help. OK now I would like comments a side thought on the cap change for TPN. Where I work the TPN has Lipids included - on a daily basis - our policy has been to change the cap daily. I would appreciate hearing from others on similar protocols / or alternatives. I think this is a good question but unanswered by research thus far. The tubing for lipids should be changed daily based on studies about malessia furfur growing in the lipids. Studies about infection with needleless connectors have not included this fungal organism. CDC says change the connector on the same frequency as the tubing. So if you are changing tubing daily, then the cap could be changed daily. This forces me to ask if TPN is the only fluids being given, then why do you even need a needleless connector? 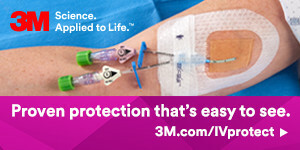 You could connect the tubing directly, then close the catheter with a dead-end sterile cap between infusions. Take this cap off and discard when it is time to reconnect the TPN again. I would like to add to the discussion. I think by not using an appropriate needleless connector on your catheter hub you are removing a line of defense against CR-BSI. While all connectors are not the same there are ones that have been shown to decrease infections over open hubs. While CDC recommends changing after lips/blood, I believe that is because they need to go to the least common denominator...connectors that cannot be effectively flushed. Ask for data that shows effective elimination of blood and microbial challenges that demonstrate effectiveness. I can only speak to ICU Medicals products but we advocate leaving in place and flushing versus qDay changes. Sorry, I disagree. There is absolutely no data to show more protection from a needleless connector in the situation being discussed. I also do not see the need for putting any brand or type of needleless connector inside the line when there is continuous fluids of any kind infusing. Your rationale for why the CDC made its statements is also making an assumption that is not accurate. They make no statement about connecting infection risk to the ability to flush the connector. This is yet another discussion where sales is interceding in a clinical discussion. Sales reps know their products, however you do not know patient care. I do know patient care as I am an RN and worked clinically for 11 years. I also spoke in general terms and did not advocate for any product. I have also, from day 1, been up front and disclosed my employer. I also stated what i believed about the recommendations, hence admitting it was an assumption. If you are changing a connector on an IV q72 hours and also change your tubing q72 hours then the need for a connector can be debated. But what about a q24 hour change as with TPN? With a connector inplace however, you add a swabbable surface that can be disinfected. Do you disinfect open hubs or always use aseptic technique in handling? With a connector in place you decrease the risk of air embolus during tubing change. I believe that the use of an appropriate connector can add to patient safety in terms of infection and hub manipulation. Lynn, you and I disagree about Bouza being an open hub study, but it is the closest there is to one as open up practice is very rare if existant at all. The huge problem is those swabbable surfaces are not disinfected by the majority of primary care nurses on a regular and consistent basis. And yes, I teach that open hubs should be disinfected with each change of tubing or cap and use aseptic technique with a sterile device attached to the connector as recommended by the CDC. Many hospitals have similar policies for hub disinfection because the catheter hub was identified as a major source of infection many years before the current controversy about needleless connectors. For home care when a patient or caregiver is connecting and disconnecting, I would agree that a needleless connector would add to the safety to prevent air emboli, but would hasten to add that a closed clamp on the catheter can do the same thing. We definitely disagree about these devices in terms of infection risk. The Bouza study compares the use of a stopcock closed with dead-end caps to stopcocks closed with a needleless connector. The authors refer to their traditional practice as an open system and they showed a lower infection rate when the stopcocks were closed with a needleless connector. My concern is the application of this study to practice in the US where stopcocks are not routinely used. This, to me, is comparing apples and oranges. Also, I would not make any assumptions about the thought processes of the authors of any set of guidelines. I believe we can only read it as they wrote it without further degrees of interpretation. The 2002 CDC guidelines stated that there was no increased risk of infection when the devices were used according to manufacturers instructions. But since 2002 there have been numerous reports and studies that are leading in the other direction of an increased risk of infection associated with some. At this point, we can not state firmly which brands or types produce the highest risk of infection. We can state, as I did on the INS webinars about flushing that studies show a split septum system to have lower rates of infection but higher rates of occlusion while mechanical valves have greater rates of infection but lower rates of occlusion. I would agree that the studies are small but one can see a trend nonetheless. I appreciate a good debate such as noted here, but I would really appreciate hearing what clinicians are doing about changing caps for TPN / with lipids. I disagree that this is a "good debate" when someone thinks it is acceptable to post such rude comments. Tom Billings is a respected member of our professional community; it does not matter by whom he is employed. And, as it has been frequently mentioned here in the past year, there is very little moral high ground to be claimed by any clinicians who have ties to industry. Lynn Hadaway has the least reason to complain. Is it not true that Hadaway and Associates are currently conducting market research under the guise of an on line "national survey"? Isn't it also true that participation in this "survey" is being solicited without having fully disclosed to participants that this project is funded by industry and intended for product support? Is sneaky back-door marketing research a reflection of our collective professional and ethical standards when it comes to research, investigation and evaluation methods? I hope not. IVAAP does not endorse such tactics. So be very careful in claims of "knowing patient care" rather than "knowing products." You are teetering on the edge of moral quicksand. It is true that I am conducting a survey of nurses ideas, concerns and practice about swabbing needleless connectors. It is true that I was hired to do this survey by a manufacturer,but that should be no surprise as most of my consulting work is for manufacturers. As you well know, this is an area that needs lots of clinical research and is important for all brands of devices. I would not call this research about the product market as this is focusing on nursing practice. Call it what you will, but I would not label it as you have. As was stated in a previous message, lets get away from the debate and hear from nurses in clinical practice answering the original question. Marilyn, it is not secret that you and I do not agree on anything but this is not the place to discuss it. On the contrary, Lynn. I think I can safely say that we agree on this: If I had deliberately chosen not to disclose up front that I was working directly for industry in a specific situation, been discovered, and then offered the most pathetically lame excuses imaginable, I am sure that I, too,would be doing everything possible to change the subject.